Share your save files with everyone here! This is probably one of the most comprehensive collections out there! 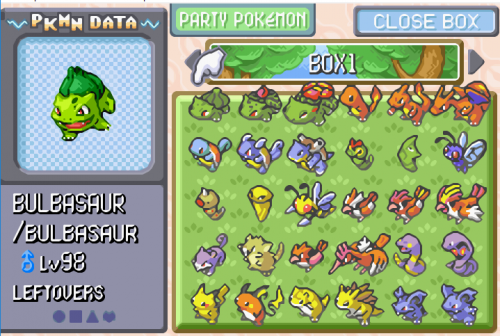 This page hosts several save files, that have stored all available Pokemon in the Boxes. Presently, there are saves for RBYG, GSC, RSE, FRLG, DPPt, HGSS, BW, B2W2, XY, ORAS, SM, USUM and LGPE. Note that variants for a few form change Pokemon were excluded from the main sets, as the saves were already full. Arceus, Furfrou, Silvally, Unown, Vivillon. 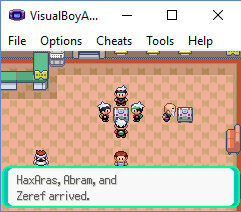 ProjectPokemon.org is not liable, if you somehow managed to get yourself banned with these Pokemon. is just so freaking long. Hence, I decided to scour the internet for a save! I don't have a save that is right before collecting Mt. Battle Ho-Oh. Any saves that I obtain from the internet or from users, will be credited here. My friend @Baegislash, from the land down unda, and I worked on a bunch of ribbon master saves earlier this year and have been talking about making them public forever. Here's an explanation of each save. Battle 7, rank 5 wifi tower. Save-state made by Baegislash I could not have done this without him. It's already helped countless people. The final battle is full of heavily RNG'ed and powerful Pokemon. Good luck! @Baegislash asked me to include the reddit post containing the instructions. So here these are if you need them. Heart Gold - All but Palmer Heart Gold save that should have the remaining streaks lined up. You should only have to do 1 of each battle to get the ribbon. As well as beat Red for the (Legend?) ribbon. Gibberish.main Baegislash's Omega Ruby save file. Used to obtain the battle Maison ribbons, ORAS Elite 4 and contests. Main.copy Baegislash's Moon save. Used for the gen 7 E4, Battle Royal and Battle Tree ribbons. Ruby A Pokemon Ruby save I made to get battle tower ribbons on. Could also be used for contests and the Hoenn E4. Using Salamence and Snorlax, I was able to get a streak of 181, while getting various other Pokemon ribbons while they were in the 3th slot. Only rarely using them as a sacrificial free switch. Level 50 and 100 clones of my team available. @Baegislash and I put a TON of work into making all these save states. We hope you find use in them. I'm hoping to contribute an XY save, Colosseum and (considering) my perfect Pokeblocks at a later date. Edit: After adding the screenshots, I feel it's important to note. I have perfect Pokeblocks. But I'm not the one who blended them. Story Completed and All legendaries caught. With Competitive Battle Ready Mons. (Box named Competitive). Here are two legitimate saves for Pokemon Y and Pokemon Omega Ruby. All Legendaries Caught and Story Completed. All Pokemon Gen 1.-7 Perfect IV's, non EV trained, Lvl. 1 male except 100% female, lowest evolutuon, ALL Legendary & Mythical's & event pokemon, Shiny high IV Wish Chansey, Max IV Shiny Mew, Celibi, Lvl. 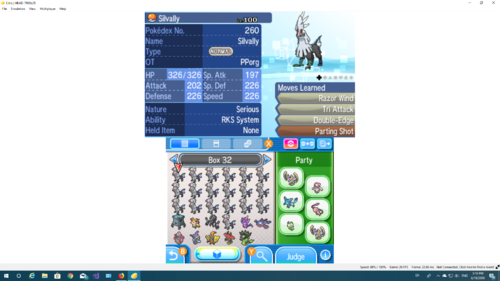 1 Manaphy, In Game Darkrai, Shaymin. Max IV Shiny XD Lugia, Articuno, Zapdos, Moltres, ALL LEGAL POKEMON! Organized by Region, Starters & Legendary's!! This is a clean game, without editing anything except the Pokémon of the team. - No hidden object collected. 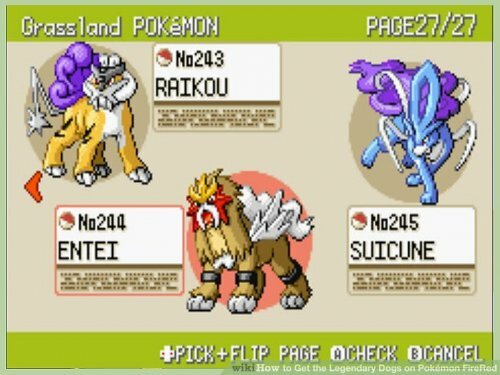 - The game is saved just before facing the Elite Four. - He was never connected to the internet. Each and every pokemon shiny (not every shiny) and competitive 31ivs/Hidden power Competitive pokemon etc.some still cometitive but not perfetct all 31 ivs stat.all are shiny pokemon execpt celebi.All pokemon legal which can be transfered to gen 7.All pokemons are genned,RNGED Legally to make it legit.Some event pokemons included.ITEMS max out.Money max out.all event items like eon ticket,aurora ticket,mystic ticket,unreleased old sea map in eng emerald etc included in save file.They have ben injected.its just like actual event happens in game.This save file is ofcourse genned cheated throught some tools.but all pokemons genned are legit.legendaries are rnged.All pokemons will obey you from start no bages except some like mew,jirachi,celebi,event pokemons,shinies legendary dogs in last box etc.these mons will obey you compeletely after you got all 8 badges.Perfect save file for starting as powerful trainer.Game saved @ First town pokemon center in city after getting pokedex and pokeballs from May. I have collected more than 500 teams on the Internet during my rest time. And there are also some teams are built by myself. The Team using instructions Please read the .TXT file. These pokemon almost are chinese language or japanese language. I use this file more like a bank save file.When I want to use a interesting team,I will copy the pokemon in team to my game save file.In order to keep BOX having enough air,I will delete the pokemon I dont use in game save file. I will update these files if I am disengaged. Ahiru's Wonderland is apparently an infamous site that hoards event Pokemon from Japan, back in Gen 3 days. Relevant screenshots of the page will match the relevant save data uploaded. Jan 1, 2019 edit: @shadowofdarkness shared some files he downloaded, probably back in 2007. 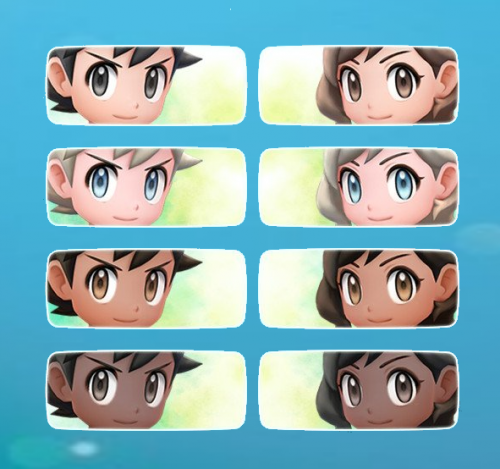 Interestingly, it went beyond Gen 3, and contained various Gen 4 files. 2. There appears to be some fakes in the saves, use at your own risk. Here are two saves to the game My Pokémon Ranch (non Japanese versions). The file My Pokemon Ranch.rar is from @thaleskpl (submitted to digiex), where the Mew and Phione are ready to be redeemed. All the player has do to is to send an egg and Leafeon over to complete the trade. 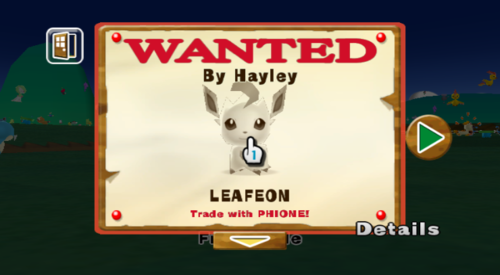 The file my poke ranch new save.rar is from @yeison_diaz (submitted to here), where the Mew and Phione and a few others has already been redeemed, but it appears there's some trades from Hayley that may still be available. Thanks to the research into the save structure done by @suloku, the tradable Pokémon have already been extracted and added to the existing entries in our In-Game Series > Pokémon Ranch area. I've started this, as I've been getting quite a bit of Citra save requests rather frequently. Also, big thanks to @Ammako for coming up with this idea, as a way to deal with the horde of requests. Start off by selecting the set you want. Each set will come with 4 folders, with choices of No Starter (not chosen yet), Chespin, Fennekin or Froakie. Use the images below on how to differentiate between Sets. 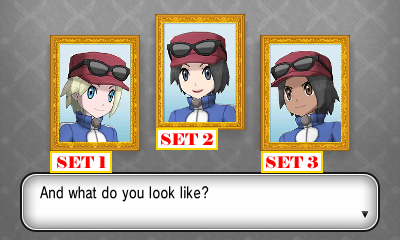 Once a set is chosen, edit your Trainer's Name and Trainer's Nickname as you please. 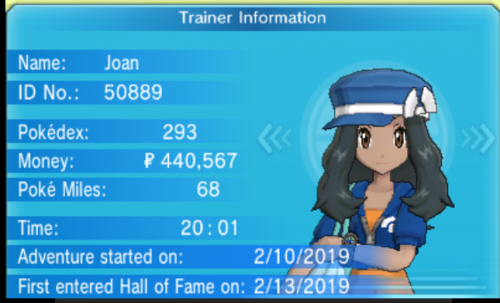 I'll recommend changing your Trainer ID and Secret ID as well, and maybe give a nickname to the starter. This way, the game will feel personal to you. I've included a couple of bonus save files, which are stripped-down save post-game saves, varying from Set 1 to Set 6 (and then 2 extras). (It originated as a request, after one user lost their save file, and simply wants to experience post-game). so to counter that, the game saves that is provided with a starter already chosen, begins after Shauna's embarrassing loss. To proceed with the story, bring the Prof's Letter to your Mom, and your journey truly begins.. 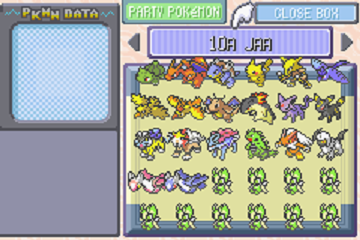 I've made another save (Chespin chosen, but all 3 Starters are in that save) that has the Town Map collected. 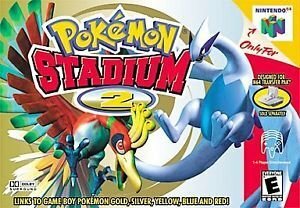 Saves for Pokémon Stadium 2 (International) and Pokémon Stadium Gold and Silver (Japan). R-2 complete. Pokémon Academy complete. Special Farfetch'd and Gligar both ready to transfer. Figured I'd upload this, I wanted a clean save to be able to fight online and maybe use in VGC. This game file was completed using a edited mon which is now deleted along with a few master balls. I just completed the game so I decided to share this file.The boxes are LAME tho.What is version number? Here you can find blank save files that include all of the Special Missions as well as all of the Extra Missions for EU, US and Japanese versions of the NDS Pokemon Ranger games. You have to finish the game to be able to play the missions in the Ranger Net! These missions were available via local wireless in Japan and without downloading by just entering a password in any other region (see below). Recover the Precious Egg! (reward: Manaphy Egg) Gain Deoxys’s Trust?! Rescue Celebi! Find Mew, the Mirage! (currently still missing in the Japanese save file ...) For EU/US Pokemon Ranger you can unlock the missions by entering one of the following codes. Press R + X + Left in Ranger Net, then enter the code for your language. Not quite 100%, but the story's been completed at least. 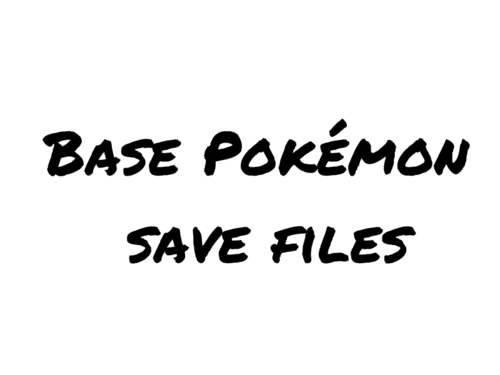 These are base save files for all Pokémon games. They have the default name and start you off right in front of choosing your starter. 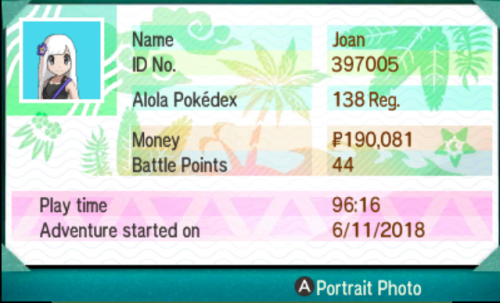 I will have other saves in the future for outside the legendary Pokémon and for post Elite Four.